Corpus Christi residents were caught by surprise Wednesday evening when city officials directed them not to shower or drink tap water after a chemical made its way into the city’s water supply. As local school districts canceled classes and residents stormed grocery stores to stock up on bottled water Thursday, a lawyer representing an Aveda hair salon and other local businesses forced to close amid the water ban sued an area asphalt company and several refining plants owned by Valero Energy Corp. in connection with the contamination. They are seeking $1 million in damages, according to news reports. Valero, meanwhile, blamed the problem on the asphalt company, Mississippi-based Ergon Asphalt & Emulsions Inc., which has a Corpus Christi location near Valero’s West refinery on property owned by Valero Marketing and Supply Co., according to the San Antonio Express-News. "At this time, we believe this is a localized backflow issue from third party operations in the area of Valero’s asphalt terminal,” a the company said in a statement. "We do not believe this issue is being caused by Valero’s Corpus Christi refineries. While the City continues to investigate this issue, we do not believe the City’s water has been impacted." Still, three area members of the Legislature – State Sen. Juan "Chuy" Hinojosa, D-McAllen, and state Reps. Abel Herrero, D-Robstown, and state Rep. Todd Hunter, R-Corpus Christi — urged residents to comply with the water-use ban. Gov. Greg Abbott’s office also was “aggressively monitoring” the situation, according to a statement, and coordinating with the Texas Commission on Environmental Quality, the Department of State Health Services and the Texas Department of Emergency Management, which was directed to organize shipments of water to Corpus Christi. A city spokesperson said Thursday afternoon that "there will be water" available for area residents to pick up in the coming days. “The Texas Commission on Environmental Quality has been directed to work with the Environmental Protection Agency to ensure this matter is handled as swiftly as possible, while maintaining the highest standards of safety,” the statement said. TCEQ spokeswoman Andrew Morrow said in a statement that the state agency was coordinating with local and federal agencies and "sampling to determine the extent of potential impact." The U.S. Environmental Protection Agency is involved, a spokesman confirmed. In response to the situation, several local school districts canceled classes Thursday. Several area school districts canceled classes Thursday, including Corpus Christi ISD, which has about 39,000 students and more than 5,000 staff members, according to Leanne Winkler Libby, director of communications for the district. “We do understand that it can always be an inconvenience, particularly for families with young children, but we felt due to the safety issue — in addition to the drinking water you have water for washing hands, water for preparing food and all that sort of thing — that the prudent thing to do was go ahead and cancel,” Libby said. The Caller-Times also reported from the scene of a local grocery store that had sold out of bottled water. Crowds of people were waiting for a new shipment to arrive by truck. “Public safety is our top priority and we are committed to ensuring that our residents have access to a safe supply of water," the lawmakers said in a joint statement Thursday morning. "Please be vigilant of all public notices and discontinue tap water usage citywide until further notice." City spokeswoman Kim Womack held a press conference at 1 p.m. Thursday where she said the city is requesting state assistance. Cities in the area such as Beeville and Taft are also helping to bring in water. At the conference, Womack said a donor has also allocated 27,000 cases of water to be distributed throughout the city. 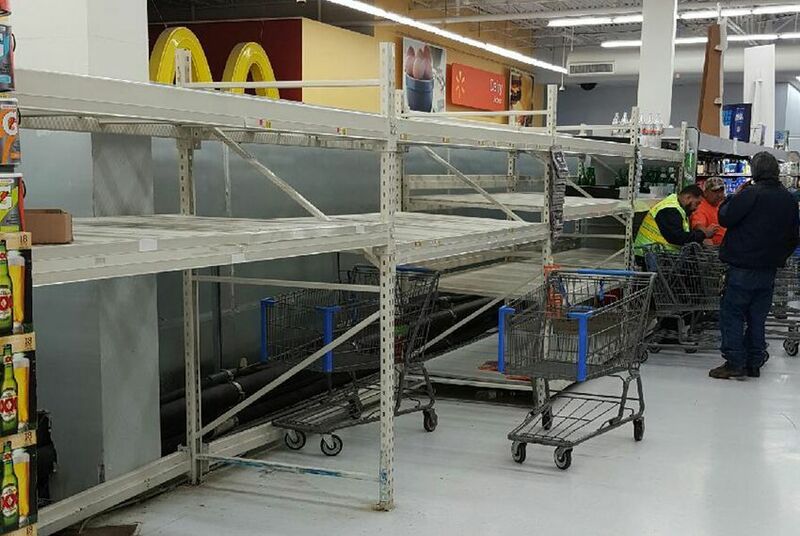 The water ban was still in place late Thursday; it’s unclear when it will be lifted. The U.S. Environmental Protection Agency announced this week that there is scientific evidence that hydraulic fracturing activities can impact the nation's drinking water resources under some circumstances. Tens of thousands of Texans live in places where the drinking water contains toxic levels of arsenic — a known carcinogen — and the state isn’t doing enough to discourage them from consuming it, according to a report from an environmental group released in March.